OtterBox Symmetry Series 360 has a clear back so your iPad Pro can be seen. 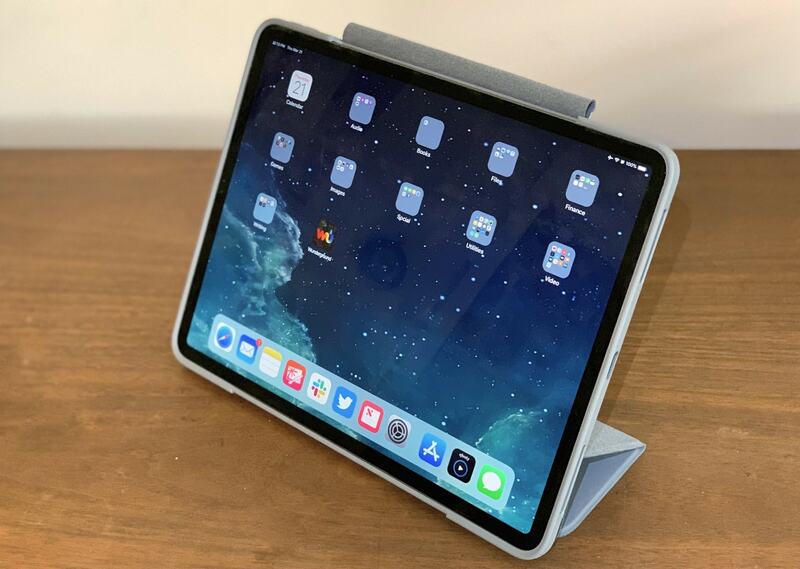 The OtterBox Symmetry Series 360 has everything you’d expect from a folio case designed for Apple’s latest iPad Pro, but it also includes a feature that might surprise you: the back is clear, allowing you to show off your 2018 iPad Pro while still protecting it. We used this slim case for several weeks, so read on to learn how it did in out testing. From the front, the Symmetry Series 360 looks quite a bit like an Apple Smart Cover. 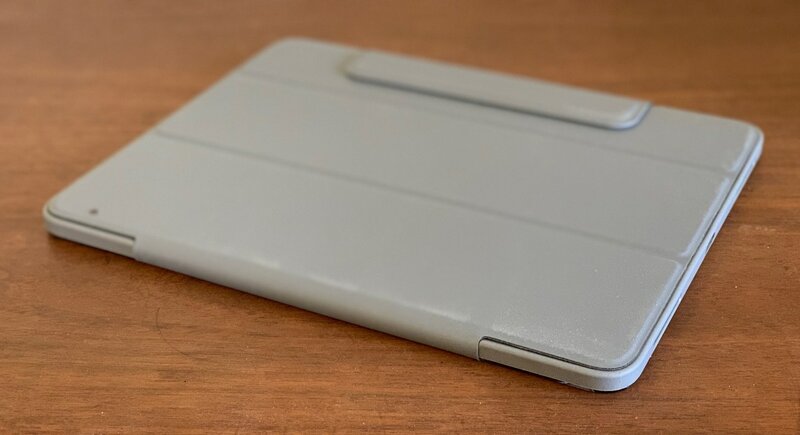 The flap of this folio case is also divided up into three segments, and these can be folded into a triangle shape behind the tablet to function as a stand. Unlike a Smart Cover, OtterBox’s offering includes a shell of polycarbonate and synthetic rubber that wraps securely around the iPad Pro models that debuted last fall. This shell covers all the corners of the tablet, as well as the sides. There are openings for the speakers, USB-C port, microphones and, most importantly, the charging station for an Apple Pencil 2. This means the the Symmetry Series 360 doesn’t interfere with using this stylus in any way. Even better, a flap on the edge of the folio cover securely holds the Pencil to the iPad when you’re carrying them around. The tablet’s three buttons are covered but can still be used. You’ll have to press much more firmly on them, though. OtterBox Symmetry Series 360 in After Dark… grey. OtterBox makes this case in black (Starry Night) or grey (After Dark). This is the color of the folio cover and sides of the shell. The back is always clear plastic, allowing the Apple logo to show through. Or you could put a Slickwraps skin on your tablet and still have it viewable. We asked several people what they thought of the look and their responses were generally quite positive. OtterBox is well known for making extremely rugged phone and tablet cases well suited to taking your device onto a job site or a camping trip. The Symmetry Series 360 isn’t one of these. 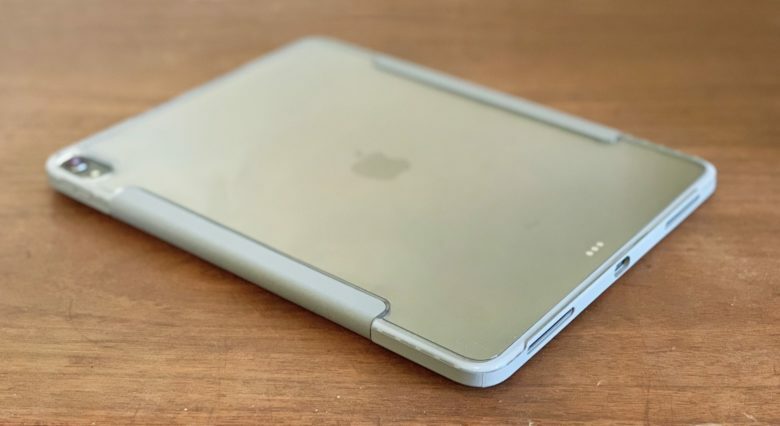 It can certainly keeps our iPad Pro from getting scratched up, and its maker promises “drop protection that’s design tested for trusted defense.” But it’s clearly intended for offices rather than factory floors. With multiple openings in the case, no protection against liquids or dust is provided. There’s no built-in clear screen protector, as there are on OtterBox’s pricier options. But there’s an upside to not being extremely rugged: this folio is relatively slim and lightweight. We tested the version for the 12.9-inch iPad Pro, and it’s 11.3 inches by 8.75 in. by 0.6 in. at its thickest so it adds only moderately to the dimensions of the tablet. The weight is 0.85 pounds, which is light for a protective case. OtterBox Symmetry Series 360 also functions as a stand. The folio cover on the OtterBox Symmetry Series 360 protects the screen when it’s in use, and a flap holds it securely closed when you’re on the go. Opening or closing the flap automatically turns the display on or off. The tri-fold design allows the cover to fold up behind the iPad Pro to become a stand. Set up one way, it holds the tablet at a 125 degree angle, useful for work or watching video. Or flip the device around and the stand props the screen up 20 degrees, just right for drawing with the Apple Pencil 2. In either configuration, the iPad is held fairly firmly so that it can be used without wobbling every time it’s touched. OtterBox is known for making quality cases, and the Symmetry Series 360 upholds that reputation. It doesn’t add excessive bulk to the 2018 iPad Pro models while providing protection from accidents. And the clear back is a unique twist on the design. It’s available on the Apple Store or from OtterBox itself. The version for the 12.9-inch iPad Pro (3rd Gen) is $89.95, while the one for the first 11-inch iOS tablet is $79.95. These are reasonable prices for a protective folio case — compare it to the $89.95 pricetag on the similar Urban Armor Gear Metropolis case for the iPad Pro.